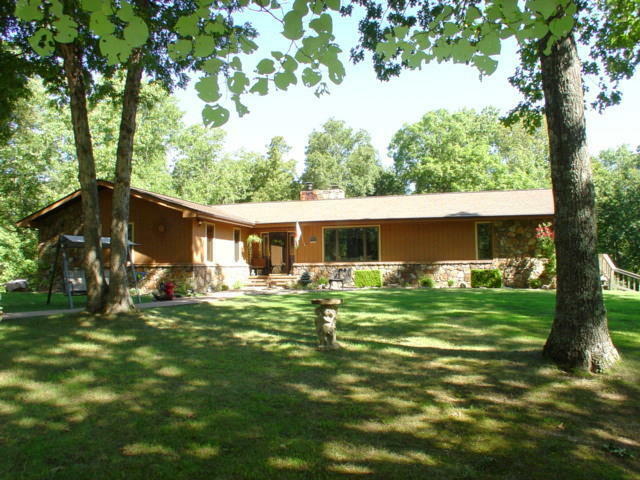 Additional acreage included making this a great price for this property. 5 secluded park like acres featuring custom almost 4000 square foot 5 bedroom, 3 bath home with an oversized 2 car garage plus a 30 x 40 detached shop building. Beautiful floor to ceiling stone fireplace in living, cook's dream kitchen with dining area and a separate formal dining room. Master suite features huge walk in closet, jacuzzi tub and step in shower. Energy saving geo thermal heat and air. This great residence all been updated within the last 10 years. Family room can be converted into additional bedrooms at minimal cost, making it perfect for a nightly rental. If you are looking for privacy and still be close to Branson, this is it. Adjoining acreage is available for additional $5, 900 per acre.